The Austin weekend was truly spectacular both on and off the track. There was an abundance of activities to keep everyone entertained, from concerts featuring top line stars such as Justin Timberlake on Saturday and Stevie Wonder after the race, to the many attractions in the Fan Zone and the paddock. The biggest novelty, though, was the pre-race driver presentation, the like of which I don't think Formula 1 has ever seen before. The 20 drivers were the stars of the show, each introduced by the unmistakeable voice of Michael Buffer, doyen of US sports announcers. Then there was athletics legend Usain Bolt, who pulled off his signature pose prior to the start before waving off the cars on the formation lap and then again on the podium when Lewis Hamilton wanted to try it for himself after the top three nishers had been interviewed by the multiple Olympic gold medal winner. I hope those who were there to witness it in person and those watching on TV enjoyed this new initiative. We are trying to bring in new elements to add to what is already a great Formula 1 spectacle. Following hot on the heels of the pre-race show, the race also proved just how exciting this sport can be, with several thrilling scraps across the field. We are all pulling together - ourselves, the promoters, the teams, the FIA – to try and give F1 fans an even more unique experience. It's well known that Lewis Hamilton loves the States and clearly it loves him back. 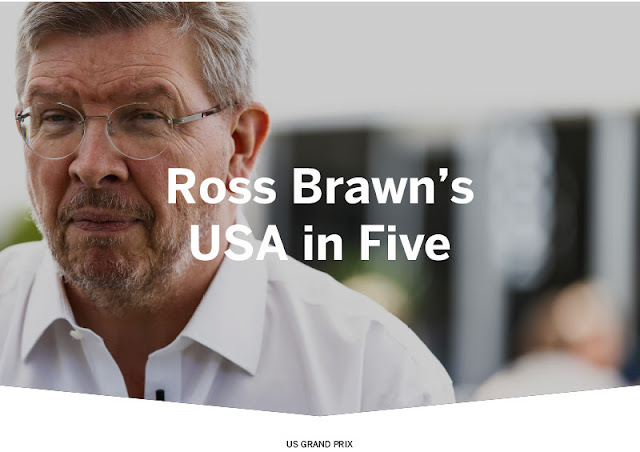 In 2007, he won the last Grand Prix held at Indianapolis and since the race moved to Austin, he has racked up five further wins from six starts. This weekend, Lewis delivered a perfect performance, running quickest in every practice session, in qualifying and in the race. Last Sunday, Sebastian Vettel got the jump on him at the start, but Hamilton stayed cool. He avoided any risk on the run up to the first turn as Vettel drew alongside, and after being passed he set about chasing down the German in a precise and methodical fashion, regaining the lead after just six laps. Although Vettel switched strategies, it wasn't enough to put Lewis under pressure, as he and his Mercedes were just too strong. On Sunday, the Champion's trophy was placed between him and Vettel during the drivers presentation and it is now closer than ever to the Englishman. He could seal the title next weekend in Mexico. The three-pointed star has made a clean sweep of all championships since the 1.6-litre, V6 turbo, hybrid power train was introduced (four Constructors' and three Drivers' to date) and it looks like a fourth consecutive Drivers' crown is not far behind. I know many of the people who make up this incredible group very well, as we worked together during the incredible adventure that was Brawn GP in 2009 and then in the four-year period from 2010 to 2013 when I was at Mercedes. Others, such as James Allison and Aldo Costa were my colleagues at Ferrari during the Schumacher era. Therefore, I am especially pleased for them and all their colleagues. The Constructors' title might not be front page news, but it represents a great deal for those who work in Formula 1. It is recognition for the quality of work at the track and in the factory and a reward for the sacrifices made by everyone including the families of the staff, because without their support it is very difficult to put your heart and soul into a job that is compelling but also so stressful and energy-sapping. I therefore congratulate everyone at Mercedes for this result: well done, you really deserve it! On Sunday, Sebastian Vettel did what he could to keep his world championship hopes alive. His last lap in qualifying was good enough to get him onto the front row and then a lightning getaway from the German gave Hamilton his only moment of concern of the whole weekend. It was not enough to beat the Briton, but there is still a very slim chance that he can fight for the title at the next round. Honestly, I felt the Ferrari was the more competitive car over the three rounds in Asia, but for various reasons, they only brought home a few points from them. In Austin, although Bottas struggled a bit right from the start, Hamilton and his Mercedes were clearly superior. If there weren't just three rounds remaining, one could talk about damage limitation, but the truth is Vettel and Ferrari have no choice but to win all the races starting with Mexico City, and hope that Mercedes falter at the last hurdle. Max Verstappen had a busy weekend, but one of contrasting fortunes. First there was the good news that he is to stay with Red Bull Racing until the end of 2020 but that was followed by the blow of a grid penalty in Austin which, when all the penalties to other drivers were applied, dropped Max to 16th on the grid. However, right from the start, he produced an amazing drive, fighting his way up the order to sixth by lap 12. The team took a gamble, putting him on a two-stop strategy, which brought him up behind Sebastian Vettel who really didn't need another driver between him and Hamilton. Verstappen then fought several spectacular duels, the last with Kimi Räikkönen, who yet again experienced the Dutchman's aggression. Just a few corners before the chequered flag, he got past Kimi to take third place. However, Max's joy was short-lived. After celebrating with his team and making his way to the cool-down room behind the podium he was then asked to make way for Räikkönen, having been adjudged by the race stewards to have had all four wheels off track in passing the Finn. It was a harsh but technically correct penalty. In all, Austin was a three-day rollercoaster ride for the youngster. It's small consolation but I think he thoroughly deserved the ‘Driver of the Day' award handed to him by fans, and once again shows just what an amazing talent Max is. I believe that once the dust is settled on this episode it would be good to review cases such as this with all the relevant parties – the FIA and the teams. In every sport technology is becoming more and more important in allowing referees to take sporting decisions with more accuracy and readiness. It's happening even in football, where a video review system is in place in leagues like Bundesliga in Germany and Serie A in Italy. In Formula 1 we already have exceptional video technology but I think we need to look at how we utilise it in order to maintain accuracy and consistency. *This is an excerpt from FOM's post race media release, I have posted this to the site upon request from several people whom were interested given Jon Noble's recent article quoting it.